For the baseball player, see Jim Strickland (baseball). 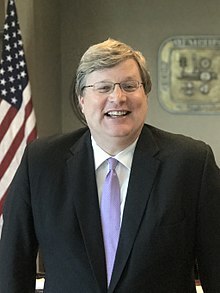 Jim Strickland (born October 29, 1964) is an American attorney and politician who is the 64th and current mayor of Memphis, Tennessee, serving since 2016. A member of the Democratic Party, he previously served as a member of the Memphis City Council. Strickland is also an adjunct professor at the Cecil C. Humphreys School of Law. Strickland is the first White mayor of Memphis since Richard Hackett in 1991. Strickland was born in Mishawaka, Indiana before moving to Memphis, Tennessee. There, Strickland graduated from Christian Brothers High School in 1982 and received a bachelor's degree and J.D. from the University of Memphis in 1989. Strickland and David Kustoff opened a law firm in 1998. His professional experience also includes working in the law firm of Glankler Brown, PLLC, clerking for Justice William H. D. Fones of the Tennessee Supreme Court, and working as an adjunct law professor at the University of Memphis. After being first elected to the City Council in October 2007, Strickland was re-elected in October 2011. In 2013, he was elected to serve as Vice Chairman and was the Chairman of the Council for 2014. On January 15, 2015, Jim Strickland announced his plan to run for mayor. Throughout his campaign, Strickland focused on crime, poverty, and blight throughout Memphis. Strickland was elected mayor on October 8, 2015, with 42% of the city's vote, beating incumbent Mayor A C Wharton who received 22% of the vote. The election was an uncommon victory over an incumbent, with the last case being in 1991. Strickland's win marked the first time since 1972 that a council member took the office of mayor. Strickland was the first white candidate to win the mayoral election in 24 years. In Otis Sanford's book Boss Crump to King Willie: How Race Changed Memphis Politics, he notes that "Strickland also made history by receiving more of a percentage of the black vote than any winning white candidate since William B. Ingram in 1963." Mayor Strickland entered office with several preceding problems: the threat of forced de-annexation for the Tennessee General Assembly, millions in unknown financial obligations, and the looming risk of losing the city's fourth-largest public company, ServiceMaster. Strickland overcame early challenges by effectively dodging the threat of de-annexation which would have potentially lost 111,000 residents and somewhere between $27 million and $80 million in tax revenue for the city of Memphis. He passed the first city budget in a unanimous and "unheard-of seven-minute" vote. The second budget passed by Strickland included a $5.9 million increase for the Memphis Police Department for recruitment and an additional $6 million for officer overtime. Strickland also budgeted for the expansion of public libraries which included the reopening of 10 branches. Another $2 million was dedicated to street paving, bringing the overall total to $18.5 million, almost double that spent on streets in the 2014-15 fiscal year. Mayor Strickland was also able to retain ServiceMaster by relocating the company to Downtown Memphis, which marked a major victory for the city, saving 1,200 jobs and $100 million in payroll. Mary Kay Wegner who was in charge of the company's search for a new headquarters called Strickland "one of the chief influencers" on their decision to stay in Memphis. Under Strickland, a focus was placed on contracts going to minority and female contractors. The percentage as of April 2017 is 21.1%. The change is a 68% increase from January 2016 when Strickland entered office. These efforts made up part of a larger plan to reduce contract disparity and approach city government in terms of data. The city of Memphis began to collect data and set monthly goals in order to target other specific issues, such as successfully reducing 911 response times, which were reduced from over a minute wait time in 2015 to 14 seconds in 2016. Due to the expansion of companies such as ServiceMaster and non-profits such as St. Jude Children's Hospital, there is an estimated $7 billion in current and future developments for the city of Memphis. Strickland and his wife, Melyne, have two children. ^ a b "The City of Memphis > Government > Executive Division > Mayor's Office". www.memphistn.gov. Retrieved 2016-01-01. ^ "Home". Vote Jim Strickland. Retrieved 2015-10-09. ^ "Strickland formally announces he will run for mayor". www.commercialappeal.com. Retrieved 2015-10-09. ^ "2015 Memphis Election Results". www.commercialappeal.com. Retrieved 2015-10-09. ^ a b "Strickland defeats Wharton in Memphis mayor's race". Retrieved 2017-07-11. ^ "Tenn.'s largest city elects 1st white mayor in 24 years". USA TODAY. Retrieved 2017-07-11. ^ Otis,, Sanford,. From Boss Crump to King Willie : how race changed Memphis politics (First ed.). Knoxville. ISBN 9781621903222. OCLC 961923636. ^ "The 9:01: Strickland's good run, Elvis Week starts and more". Retrieved 2017-07-11. ^ Phillips, Jerica. "Strickland: De-annexation could be 'devastating'". Retrieved 2017-07-11. ^ a b Memphis, The City of. "The City of Memphis > Government > Executive Division > Mayor's Office". www.memphistn.gov. Retrieved 2017-07-11. ^ a b c "Winners and losers in Mayor Strickland's 2017-18 Memphis budget". The Commercial Appeal. Retrieved 2017-07-11. ^ "Done Deal: How Memphis saved ServiceMaster and its 1,200 jobs". Retrieved 2017-07-11. ^ a b "Meet the woman leading Memphis' diversity efforts". The Commercial Appeal. Retrieved 2017-07-11. ^ Coy, Greg (2017-02-08). "FOX13 Investigates: 911 response times in Memphis". WHBQ. Retrieved 2017-07-11. ^ "Memphis District 5". www.memphistn.gov. Retrieved 2015-10-09. This page was last edited on 7 April 2019, at 20:37 (UTC).